There are times in our lives when words are of little benefit. When a loved one is lost, nothing but the passage of time can ease the pain. Even still, we gather around and support those who are grieving, hoping that our mere presence can provide some measure of comfort. We remember the deceased, we cry for the loss, we laugh for the memories, and we hold the survivors just a little bit closer. We also look for meaningful ways to remind the surviving family that they are not alone, and for as long as people have collectively grieved for the fallen, they have honoured both those left behind and the deceased with flowers. 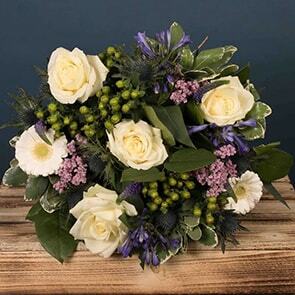 There is a myriad of options when it comes to sympathy & funeral flowers. Generally speaking, larger bouquets, sprays, and wreaths, are purchased by immediate family members and are placed on display during the service. Standard bouquets and arrangements may be sent by anyone to the funeral home or to the home of the surviving family members. Ideally, those wishing to pay respects by sending flowers should do so as soon as receiving notice. However, a bouquet sent to the family months after a loss is generally welcomed, simply because the remembrance remains thoughtful, even after the standard mourning period has passed. Some traditions called for bouquets to be pieced together, one flower at a time, by those who wished to pay respects. Each flower was chosen for a reason, whether for the symbolism of the type or colour, or because of a special tie the decedent had to a flower. Nowadays, white flowers of almost any kind are traditionally given, as they typically represent peace or purity. Pastels are often used to accent these pieces, offering added warmth to the display. For those who know the family or the decedent well, colourful arrangements may also be chosen. In these cases, the bouquets are seen as a celebration of life. They also have the ability to brighten a room and make a floral gift stand out from the others that may be sent. Our prayers are with you. With heartfelt condolences. With deepest sympathy. 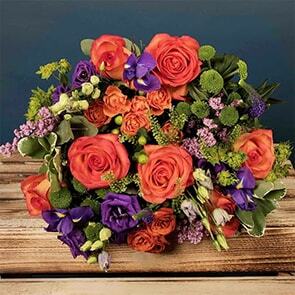 If you’d like to send flowers to show someone you’re thinking of them during a difficult time, Bloom Magic can handcraft and deliver a thoughtful and meaningful arrangement. Browse and send funeral and sympathy flowers, specially crafted to help you express what your words cannot. Indeed, flowers play an important role in grieving. Thanks for the write up. I bought <a href="http://kabloom.com/occasions/sympathy.html">fresh sympathy flower arrangements online</a> at best price. Check it out!